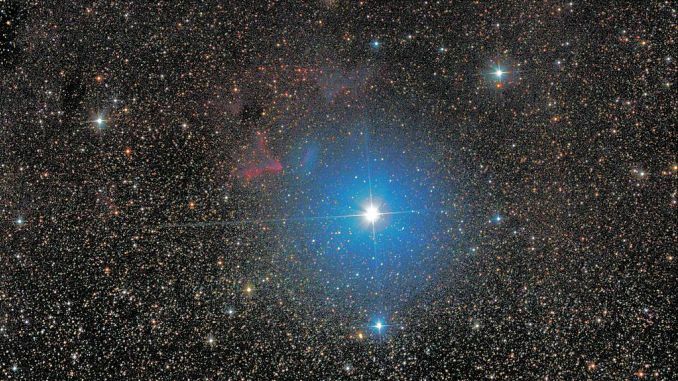 Unlike most other prominent naked-eye stars, the star Gamma Cassiopeiae does not have a traditional Latin or Arabic name, which is strange considering that the star is relatively bright with a mean apparent magnitude of 2.47, and located right in the center of the distinctive “W” of the constellation Cassiopeia. Nonetheless, Gamma Cassiopeiae was a major navigational beacon during the early space missions, which is probably why astronaut Virgil Ivan “Gus” Grissom dubbed it “Navi”, a play on the spelling of his own middle name. In terms of naked-eye visibility, Gamma Cassiopeiae is visible throughout the year for most northern hemisphere observers, since the constellation is north circumpolar. Southern hemisphere observers above latitude 33 degrees south may be also able to observe the star under favorable seeing conditions, albeit low on the northern horizon. In terms of its evolution, Gamma Cassiopeiae is now classified as B0.5 IVe, in which the IV is an indication of the star’s luminosity, which in turn, identifies it as a sub giant that has almost exhausted it supply of hydrogen fuel, and is now evolving into a giant star. It is also an eruptive variable star, with an irregular period in which its brightness rapidly varies between +1.6 and +3.0. In fact, the star is the prototype of a class of variable stars known as the Gamma Cassiopeiae variable stars. The “e” in its classification refers to the fact that the stars’ spectrum shows hydrogen emission lines, which places Gamma Cassiopeiae in a small group of stars known as “Be” stars, of which Gamma Cassiopeiae is in fact, the prototype as well. As an example of the star’s variability, Gamma Cassiopeiae experienced a shell episode during the 1930’s, when its outer layers brightened to more than +2.0, and then rapidly reduced to a magnitude of less than +3.4 in a relatively short period of time. The star’s brightness has since increased to about magnitude +2.2, which outshines both a Cassiopeiae and ß Cassiopeiae, which shine at magnitudes +2.25 and +2.3, respectively. Unlike other sub giant and giant stars that generally have low rotational velocities, Gamma Cassiopeiae has a (calculated) rotational velocity of 432 km/sec, which when combined with its high luminosity, has resulted in both a pronounced oblate shape, and a circumstellar decretion disc. This disc contains material that has been flung off the star by its high spin rate, and is thought by many investigators to be the cause of the star’s variability, although this remains to be determined conclusively. Nonetheless, Gamma Cassiopeiae is also the prototype of another small group of stars that emit X-rays that are at least ten times more energetic than X-rays emitted from other B-, or Be-type stars. The nature of this X-ray spectrum is Be thermal (and exhibits both very long and short cycles), and although the exact source of the emission is still in some doubt, some investigators believe that is caused by plasmas that have temperatures in excess of at least ten million Kelvins. Historically, it was believed that these plasmas resulted from matter that originated from the star, typically in the form of a very hot solar wind, or from material that is deposited onto either a decretion disc, or a nearby degenerate companion such as a neutron star or common white dwarf. However, the biggest problem with this hypothesis include the fact that while a neutron star could very easily power an X-ray emission of 1033 erg/s (as in the case of Gamma Cassiopeiae), X-ray emissions from neutron stars are known to be non-thermal, which is contrary to what is being observed in the X-ray spectrum of Gamma Cassiopeiae. Based on current knowledge of the star, it is more likely that the very strong X-ray emissions are the result of conditions within Gamma Cassiopeiae itself, or perhaps from some complex, and currently ill-understood interaction between the star and the enormous decretion disc that surrounds it. The latter view is supported by the fact that the observed cycles in the production of the X-ray radiation show a strong correlation with (optical) light curves from the star, which suggests that the X-ray emissions might be related to changes in the various UV line and continuum changes associated with a typical B-type star. One other view is that the X-ray emission might be caused by interactions with ejected material that is still close to the star. Direct measurement of Gamma Cassiopeia’s (greatly distorted) magnetic field has proven to be impossible due to the stars’ hugely broadened spectral lines, which is caused by its high spin rate. The only reliable information about the stars’ magnetic field is based on a robust and persistent magnetic signal with a period of 1.21 days, which suggests that at least a part of the magnetic field is firmly fixed on the star’s surface. In fact, UV and optical spectra show strong, alternate blue-, and red-shifted “ripples” with periods of several hours, which suggests that large “clouds” of material are being held captive close to the star’s surface by powerful, but localized magnetic fields. In turn, these observations suggest that some form of magnetic interaction is taking place between the star and its decretion disc, which results in the observed copious production of X-rays. However, the main problem with this view is that this mechanism (known as a disc dynamo) has to date not been observed to exist around any other star(s). Gamma Cassiopeiae is known to have two faint optical companions, designated components B and C, respectively. “B” is located about 2 seconds of arc away, and has an apparent visual magnitude of 11, while “C” is located only about one second of arc away, and has an apparent visual magnitude of 13.